Mix the sugar, soy sauce, and rice-wine vinegar in a small bowl until the sugar has dissolved. Place the cucumber and carrot in separate dishes; divide the sauce between the two. Let marinate 1 hour. In another small bowl, combine the eggs and ¼ cup mayonnaise. Set aside. In yet another small bowl, stir together the remaining mayonnaise and Japanese mustard. Set aside. To assemble the sandwiches, spread 1 tablespoon of the mayonnaise-mustard mixture on each of the 6 slices of bread. Gently squeeze the marinating liquid from the cucumbers; divide the cucumbers into three portions. Place one portion of the cucumbers at a diagonal on the mayo-smeared bread, from the bottom left corner to the upper right corner. Repeat with two additional pieces of bread. Gently squeeze the marinating liquid from the carrots; divide the carrots into three portions. Place one portion of the carrots at an opposite diagonal on the same slice of bread to form an X. Repeat with the other two pieces of bread. 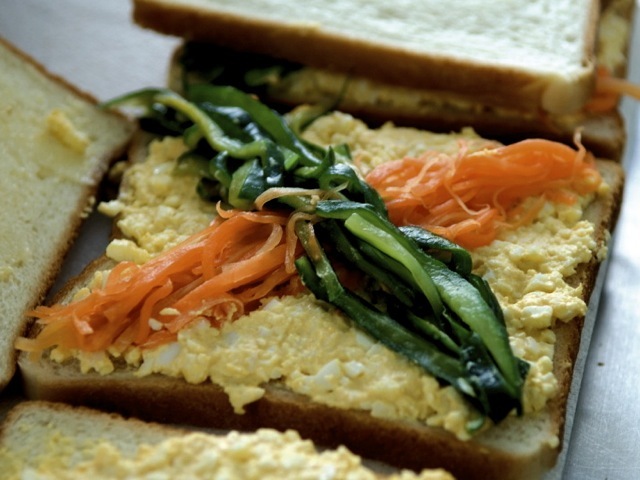 Place a small spoonful of the egg-mayonnaise mixture in each of the four empty triangle spaces between the veggies. Repeat with the two other pieces of bread. Top each dressed sandwich half with one of the remaining slices of mayo-smeared bread. Cut each sandwich into four triangular wedges to reveal the colorful vegetables. Culinate editor's note: If your rice-wine vinegar is already sweetened, skip the additional sugar called for in the marinade.